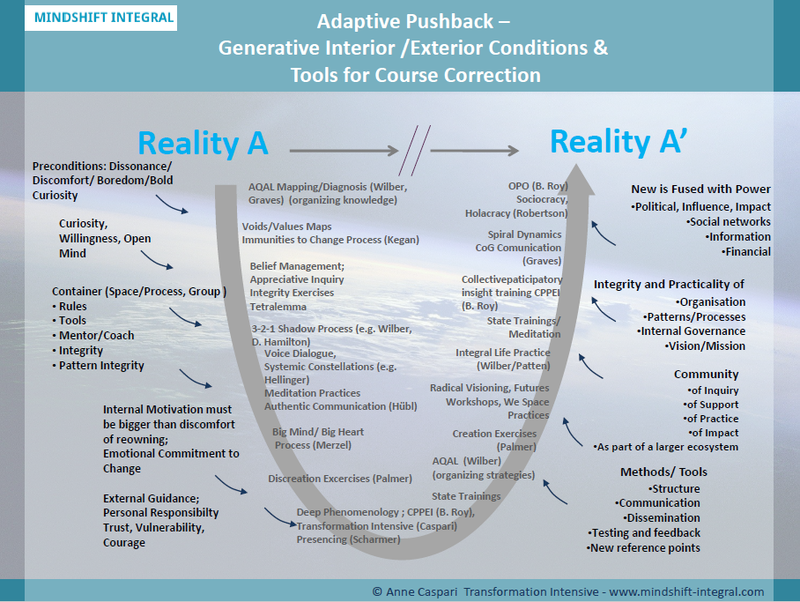 The following slides picture transformative processes in their stages, the adaptive pushback and escape mechanisms that usually get triggered on the process path, as well as a variety of tools, methods and conditions (internal and external ones) that can be used for course correction or are favourable to the process. The diagrams picture patterns that I have observed in my work as coach for personal adult development over the last 15 years. These recognizable patterns are indicative of the stages of the process, its depth, the amount of resistance and the type of assistance needed. They have proven useful as guiding indicators, both for personal work and professional coaching. They are valid for both individual and group processes, although they would slightly differ for the collective transformation. I used the U-shape as a visual metaphor, as it lends itself neatly to common archetypes of transformative work. The invitation is, however, to use your imagination and picture this as more than a linear process. 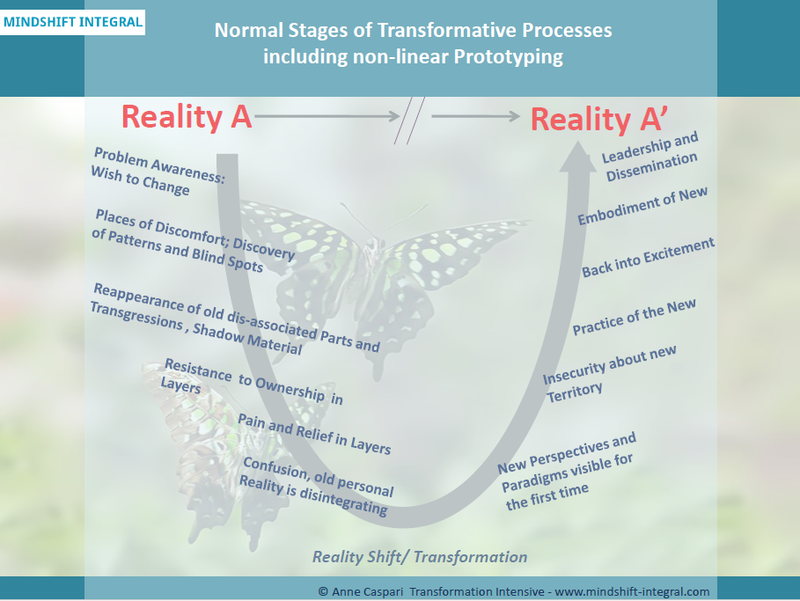 Transformative, non-linear processes don’t follow a neat path with steps from 1 – 8. Rather, much like a holographic image, all of the process goes on all of the time. Just feel into this: some of the escape mechanisms and fears aren’t even triggered unless there is a goal that leads out of comfort zone. The approaches for creating favourable conditions and the methods and tools for course correction that are listed are examples of tools that I have personally worked with and that have also proven extremely helpful. The Transformation Intensive Courses are conceived with most of these tools, approaches and frameworks in mind – an eclectic mix of instruments, used with experience, subtlety and high precision to make this work as simple, deep, light, and exciting as possible. 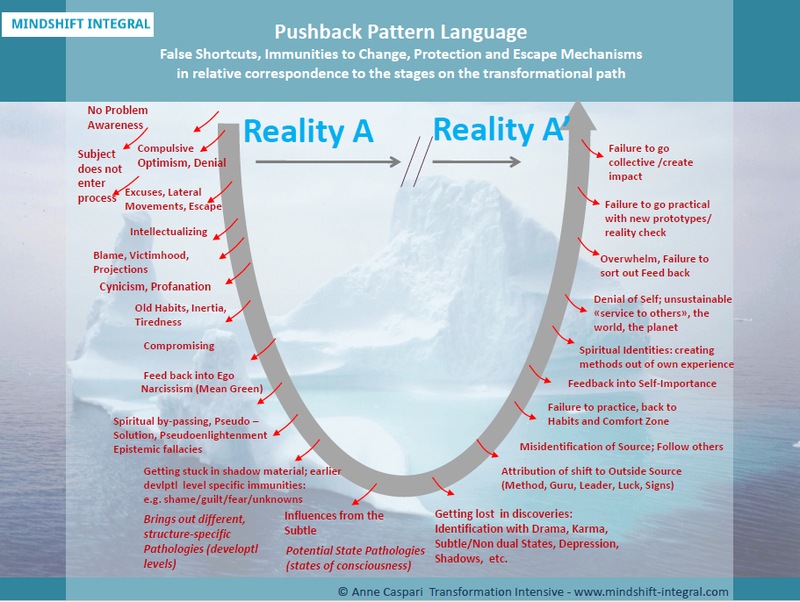 Listen here to my conversation with Ken Wilber about these 3 Diagrams and my work so far. Leading change: First in the subtle, then in the world.